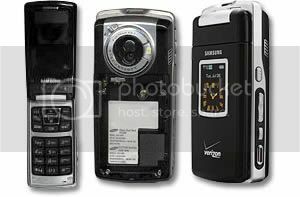 The Samsung SCH-a990 phone from Verizon Wireless features a 3.2 megapixel camera with flash, auto focus, zoom and video capture. The SCH-a990 from Samsung weighs just 4.4 ounces with the size of 3.80″ x 1.88″ x 0.82″. The Samsung SCH-A990 is available in stores from July 24, 2006 for the price of $349.99 (USD) after $50 (USD) mail-in rebate with a two-year contract, online from Verizon’s website.